What sane person runs thirteen miles in a row, on purpose, on a Saturday, getting up before sunrise to do it? Apparently, me. The Gasparilla Distance Classic Half and Full Marathon were March 1, 2009, and there I was, in the dark, waiting for the gun, surrounded by other crazy people getting ready to run. I had begun this journey about a year before, when I picked up running as (I thought) a way to get in shape to get back into wrestling. I’ve run three short races and signed up for this half-marathon, but have yet to step on a wrestling mat. So we know how that worked out. On this dark morning, I wasn’t alone. My neighbor, Sarah, was running the half too. She has multiple half and full marathons under her belt and was running for fun. I knew I wouldn’t see Sarah during the race, as she’s a faster and more experienced runner than me. The real fan club, the ones as crazy as I am, was my family – my wife, two kids, and even my dad, all of whom got up before daybreak to come cheer me on. I had two goals on race day: finish on my own two feet under my own power, and do it in 2:30 or less. In prior, shorter races, I tended to start off too fast, so I found the pace group for the marathon (who would share the first seven miles of the course with the half) that seemed to be the fastest I would want to run the opening miles. That should have been the 11 minute/mile group, but for some reason I glommed onto the 10:18 minute/mile group, figuring if I ran faster than that, I knew I’d be in trouble. The gun went off, and we crossed the start line about two minutes later. With the waiting over, and the race begun, my nerves had largely subsided, and I focused on sticking with the group in the densely-packed street. The first mile, our “gun time” was just over 12 minutes, on pace with what I’d expected. We hit the bridge that would take us to our loop around Davis Island, and the crowd jammed together, faster runners jumping on the sidewalk to pass the pack. At the end of the bridge, Mile Marker 2 and the clock told us we were at 22 minutes. Suddenly, I realized I had made a mistake trying to keep up with this pace group – it was a long race ahead of us and I was already feeling a bit winded. I slowed down to a more relaxed pace, let the group fade into the distance, and just focused on getting my own rhythm. That worked well for the next few miles. Davis Island is a fairly pleasant place to share with a few thousand other people before dawn on a Saturday. The next few miles ticked away, and by mile 5, I had clocked in at just over 56:00. I was feeling good, and looking forward to seeing my family who would be waiting for me once we got back off the island. Around mile 6 we hit the bridge back to the mainland. I must have made some kind of noise reacting to the slope, because the fellow next to me thought I was complaining about the concrete. Not so – I train on plenty of sidewalks, but few hills. He was from upstate New York, he told me, and encouraged me to incorporate more hill training because it makes the flat parts seem much less difficult. (I have found a nice hilly area near St. Leo that I’ve run once and will do more of that in the future.) He sped away on the downhill, and I noticed he was wearing a “50 States Marathon Club” shirt. Coming off the bridge, looping back past the eventual finish line to start Mile 7, we got to see the half-marathon winner – the improbably-named Richie Cunningham – coast to victory at 1:14. (He also won my age group – the Men’s 35-39.) I was still feeling pretty good at that point, looking for Dineen, Dad, and the boys by the road. I saw them – and the neon-green “Go Dad!” sign they had made during the wait – and pulled over for hugs, then took off again. At Mile 8, the course curved around on to Bayshore Boulevard, and the discussion we had about hills suddenly became quite relevant. Not because Bayshore is hilly – it’s just a flat, wide, waterside avenue – but because that turn delivered me straight into the teeth of a forceful headwind that made it seem like I was climbing a steep hill. For most of mile 8, I had little choice but to walk, and made about as much speed as I would have running. The eventual marathon winner apparently lost about 10 minutes on his winning time from the previous year due to the windy conditions, so it was a real force to be reckoned with. The wind, of course, was a harbinger of changing weather, and mile 9 brought cold, stinging rain but thankfully, less wind. I was able to pick up the pace quite a bit through here and made good time to the turn-around point in front of my old elementary school. At some point around there, I saw my neighbor Kyle (Sarah’s husband – he had run the 15K on Saturday) and got a high-five in passing. The rain lightened up after the turnaround, and the wind was at my back now, so I was able to get back on a reasonable pace. At Mile 10, despite having walked much of Mile 8, I was only about 1:56 into the race – meaning I could still finish under 2:30 if I kept an 11-minute pace. The miles weren’t quite melting by, but my head was in just the right place – positive, feeling strong. But fear shot through me a few minutes later – my calves began to twinge, threatening severe cramps. I slowed a bit, took a short walk break, and kept running. Everything seemed OK, and I was still on pace to beat 2:30. “Me, too,” I replied, and then let out a sharp yell. My calves had completely seized up and sent a stabbing pain through my body. I could barely move, let alone run. I stopped. Whoever that woman was, I feel bad for her now. She was clearly concerned when I cried out, and I can only image what kind of head games my sudden blowout played on her. Of course, at that time, I had bigger problems. With just under two miles to go, my legs were frozen in agony. I tried relaxing the foot, and was rewarded with the kind of pain I would expect if I had detached the calf on one end, tied it to a tree, and kept walking. In a blind panic, I moved my foot all the way the other way, toes pointing up, and the pain gradually began to ease. After some trial and error, I realized I could walk without triggering more cramps as long as I kept my toes pointed up as far as I could. I walked for a bit. With more trial and error, I developed a hobbling gait, toes pointed up and inwards, that allowed me to run in sort of stiff-kneed hop-shuffle. Every time I slipped out of that gait, more stabbing pain rewarded my lapse. At this point, my goal of 2:30 was gone, and my only remaining goal was to cross the finish line under my own power – still within reach, unless the cramps totally shut me down. As I approached the 12 mile marker, I did not yet know what lay ahead of me that would dramatically change the end of my race. Hobbling along, I heard a shout: “Mike!” I looked over, and my friend Andy was there. Andy had run his first marathon about a year before, and we sometimes trained together when schedules and injuries allowed. 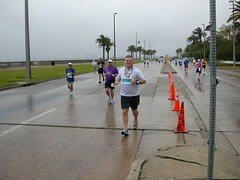 Andy had secretly conspired with my wife that he would wait for me near the end of the race to cheer for me. And wow, did that work. Seeing a friendly face where I least expected it, someone who knew all too well what I was going through, sent a surge of relief through me. I told him about my calves, he offered advice and encouragement, and then ran ahead to get a couple of pictures. Ah, vanity – the second factor that boosted me in that final mile. The course was suddenly crawling with photographers. These were pictures I knew I’d want to keep, so I broke out my best smile, kept trotting the best I could, and flashed the camera a thumbs-up. Then the next camera, then the next. I stopped counting miles and started measuring my progress in photographers. Suddenly, the finish line was only yards away. My family was on the left, waving the sign they had made, and while I’d like to say I surged at that moment, the truth is that I simply didn’t quit – but that’s all I needed. Across the line, hands raised in triumph, I accepted a substitute medal (they ran out of the real ones) and a mylar wrap, and I had finished my first half-marathon, under my own power and on my own two feet. Chip time: 2:37:21. A week later, I’m still sorting out my reactions to the race. They are uniformly positive, even though I missed my 2:30 goal. I know that I would have made that but for my cramps, and I’m pretty sure I could have avoided those had I trained a bit less timidly and put a few more miles in during the last weeks before the race. I knew going in that I’ve have to deal with the physical challenge of the race, but what has surpised me is how much progress I made in my head. During training, if something began to hurt, or if I ran into a problem of some kind, I was likely to just stop, because I didn’t want to injure myself and jeopardize the race. During the race, quitting wasn’t an option – I either had to fix the problem or fail. And with the pressure on, I found myself fixing problems as they cropped up – most notably, how to finish without the cooperation of my calves. The other mental block that fell away for me was the tedium that long runs usually bring. In the race setting, each mile marker was more of a data point – calculating my pace and goal time – where a mile marker in training brought up thoughts of slugging it out for the remaining distance. The miles in the race didn’t feel especially significant – passing mile 11, breaking into “never gone here before territory,” I didn’t even reflect on it, focused completely on the finish line. And in the days since the race, I still perceive distance differently than I did before – less of a burden than a waypoint on the ultimate path. And now, I’m looking forward to my next race. Congratulations. I have been worried about my half marathon coming up- this Sunday- which is my second one (but a long time coming). Your article really brought my spirits up and inspired me to do my best. Thank you. Hello there from the other side of the country–I just came across your blog while looking for information about half-marathons and the ‘aftermath’…I just finished my own first half-marathon yesterday up in Phoenix…nice to know you’re still running and that you went all the way to a full marathon! inspiring! Keep running! This was great to read. I appreciate all the detail about the experience – both mental and physical. I am running my first half at the end of the month and am a little fearful that I haven’t put in my running miles. I will find out sure enough! Thank you and Congratulations! Really enjoyed reading this. I just ran my first half yesterday at the Georgia Half Marathon and could relate to this on such a close level. I too had that goal of 2:30 till at about 11.5 miles I could feel my calves locking up and I was hurting pretty bad. In all honesty, I was not ready for a 13 miler as the most I had ever run was 9 miles but I gave it a go and I am very proud of myself finishing at 2:40. I started looking at all my friends times that were anywhere from 30-50 min faster than me and that hurt to see at first but we have to all be realistic with out own goals or we will never reach them. My friends all have far more experience and have run multiple 13.1 races so to compare to that would be foolish. We all have to look at our own selves and evaluate what is realistic and how much we wnt to accomplish. Great post and hope you stay with it! !